ClockIt time and attendance solution support notifications across the web, mobile, Slack and email. Configure the notifications as per your business process and let ClockIt do the rest. ClockIt time clock notifications are designed to work the user, reporting managers and admins of your company. With a total of 8 smart notifications and more in the pipeline, you can be informed about your time clock events for your company in real-time. Available for iOS, Android, Web & Slack. As an admin, you can receive notifications for your entire company. Ideal for small teams where business owners want to know all punch events for all their employees. Know the punch events for just your team. Ideal for companies where managers control most of their team activities. Let managers take control of the team! Let your users know about their punch events. Inform them when they forget to punch, lateness, absence etc. Avoid punch being forgotten. With reminders to clock in clock out, your team will never forget to punch on time! As an admin or a manager, you will always be notified when they do. This means lesser time spent doing corrections at the time of payroll. ClockIt time clock notifications are smart and can be configured based on your business needs. Setup notifications as per your business rules so that you can have an effective time clock solution that your employees can easily adopt. Setting up a simple reminder notification and absence notification can go a long way for your business. Notifications on my mobile helped me reduce my punch errors and saved me tons of time getting payroll done. All notifications can be configured to be delivered to specific channels. ClockIt time clock notifications support 4 unique channels that you can pick from. Have your notifications delivered to your email. Ideal for notifications that are not critical but needs to be logged for future reference. Have your notifications delivered directly to the web browser. Enable browser notifications for ClockIt and ClockIt will deliver notifications to Chrome, Safari and Firefox. 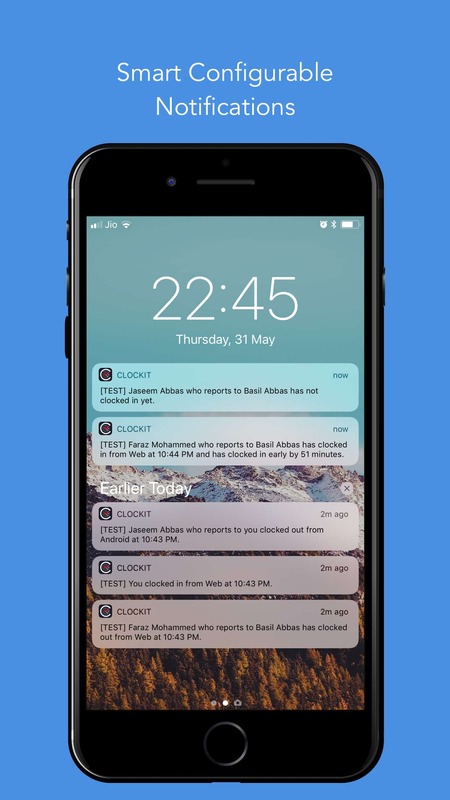 Have notifications delivered directly to your ClockIt mobile app. Ideal for critical notifications such as absence and late notifications. Looking to deliver notifications to Slack. We have you covered. Enable channels that need to send notifications to a channel and ClockIt will do the rest.